Saluki. Persian Greyhound, Tazi, Gazelle Hound. It's very names suggest the distance without end of yellow sands, stretching away into the mists of the horizon. And as such, the true origin of this beautiful breed has been long lost in the shifting sands of time. Evidence suggests the saluki was historically bred in the Fertile Crescent. Images of running dogs with long, narrow bodies adorn pottery found in Susa that dates back to 6,000 years ago in ancient Mesopotamia, with one writer suggesting that these might depict the ancestor of the saluki, despite the depictions bearing erect, pointed ears. Salukis and greyhounds were increasingly depicted on Egyptian tombs from the Middle Kingdom (2134 BC–1785 BC) onward, however it was during the Eighteenth dynasty of Egypt that dogs resembling the saluki rose to prominence, replacing the “Tesem” (ancestor of the Pharaoh Hound) in ancient Egyptian art. 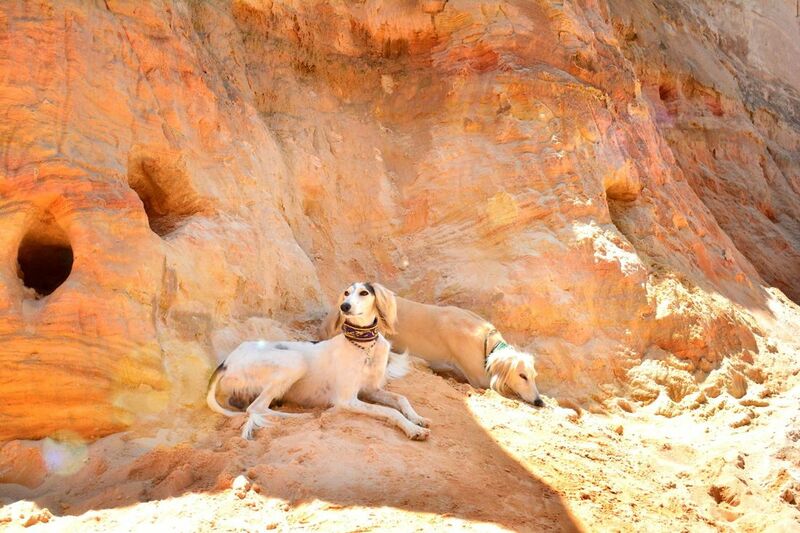 What is not up for debate, is the salukis importance in the lives of the Bedouin tribes. Their ancestors have inhabited the southern edge of the arid Syrian steppe since 6000 B.C. Considering how many people in this region of the world despise normal dogs, it may be surprising how well regarded, even revered, the saluki was. The saluki, however, was not a normal “dog” (Kelb). They were a sacred gift from Allah, El Hor: the noble one. And therefore completely distinct from the ordinary “unclean” dogs that tended their sheep. Salukis are a hunting hound, and were principally used for hare, fox and other desert animals. They are described as “running down a desert hare almost in a moment.” But their favorite sport is “the gay chase of the shy gazelle,” for which they received one of their many names. The gazelle is one of the swiftest animals in the desert, with speeds between 45 and 52 mph. 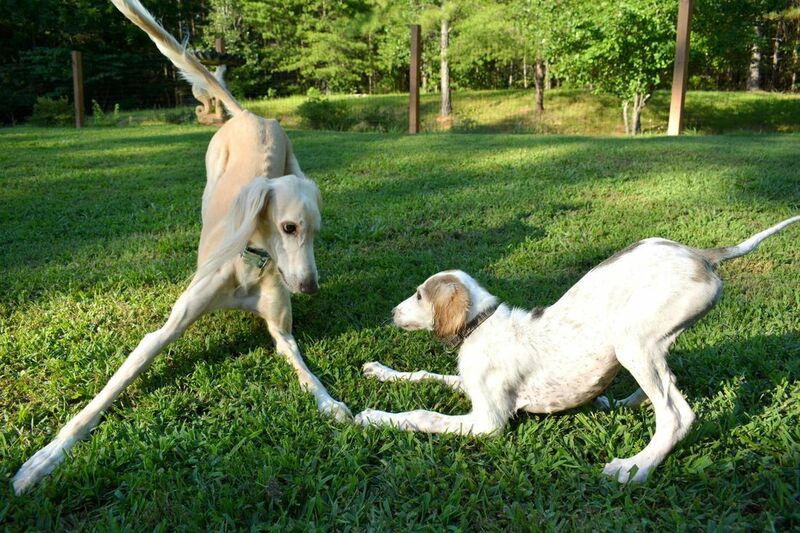 The saluki, though swift, is not as fast as their game. Reaching only speeds of 37-40 mph. They would separate the animal from its herd, and tire it out for their handlers, or until they could level with it. Galloping over the harsh desert sands, and sometimes thick scrub, they were also famous for their use in falconry. 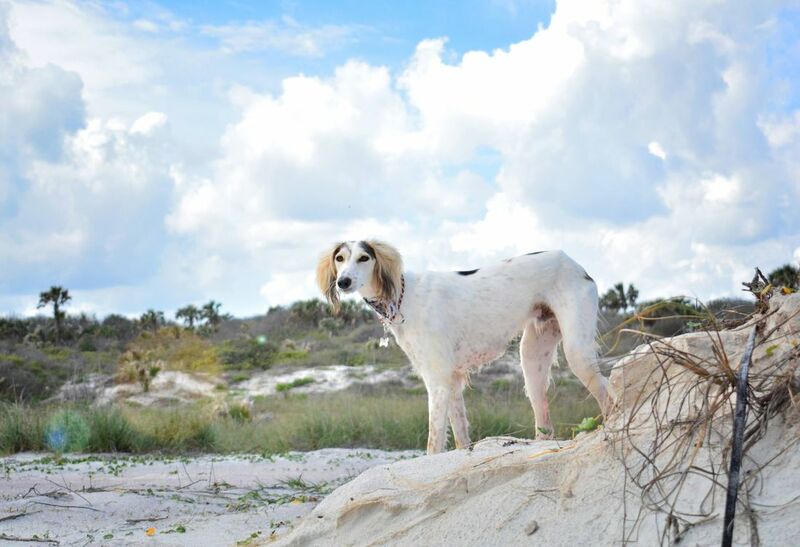 Distant cousins of the Afghan Hound, the Saluki is known for its long, feathered ears and tail. However they also come in a “smooth” variety, like the common coat of the Greyhound. The action of the Saluki is different from that of a Greyhound; it is more springy when walking and at a trot is more prancing. When walking “at ease”, dogs will frequently walk for a few paces with a movement resembling that of a camel. Beautiful but reserved, the Saluki is affectionate without being overly demonstrative. He's happy to prove his loyalty through quiet companionship. Not everyone is offered the gift of a Saluki's devoted friendship, but those happy few who receive it are appreciative of the honor.